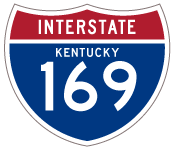 Interstate 169 is the proposed designation for the southern 34-mile section of the Edward T. Breathitt Pennyrile Parkway from its end at I-24 near Hopkinsville to its merge with I-69 north at the I-69/Wendell H. Ford Western Kentucky Parkway systems exchange (Exits 34AB) northeast of Nortonville. Currently no time table has been established for the inclusion of I-169 signage along this portion of the parkway. Additional photos of the “Future I-169 Spur Corridor” sign unveiling event at Hopkinsville this morning. Not long after the completion of the parkway to Interstate 24 in 2011, provisions began to petition the Federal Highway Administration (FHA) and Congress to have the section between I-24 and the Western Kentucky Parkway designated as an I-24 spur.3 Since the portion of the parkway between the Wendell H. Ford Western Kentucky Parkway and Henderson had already been signed into law as Interstate 696, state legislatures wanted a separate designation for the remaining portion, citing its importance as a regional high-speed corridor. Systems exchange between I-69 (Edward T. Breathitt Pennyrile Parkway) and Western Kentucky Parkway northeast of Nortonville. Interstate 24 kinks toward Miller Mill Road in this scene two miles out from the trumpet interchange with Edward T. Breathitt Pennyrile Parkway (Exit 81). Formerly named just Pennyrile Parkway, the 71-mile parkway was renamed to honor the Governor (1963-67) who pushed for increased highway funds throughout the state. Photo taken 04/05/13. The I-24 mainline bisects crop fields on the one mile approach to the Pennyrile Parkway (Exit 81). Opened in 1969 as a toll facility, the parkway has become a significant north-south corridor in Western Kentucky. Today the Edward T. Breathitt Pennyrile Parkway ties I-24 with Hopkinsville, Madisonville and Henderson. Photo taken 04/05/13. Traffic prepares to depart for the Pennyrile Parkway north for Hopkinsville along I-24 west. Completed in phases by 2011, the southern seven miles were extended from U.S. 41 Alternate (Fort Campbell Boulevard) to meet I-24 near milepost 81. The Edward T. Breathitt Pennyrile Parkway stems north from Hopkinsville to meet I-69 at the Wendell H. Ford Western Kentucky Parkway exchange (Exit 34) near Nortonville. I-69 joins the parkway north to Henderson. Photo taken 04/05/13. Lafayette Road passes over Interstate 24 east beyond the two mile approach to the Edward T. Breathitt Pennyrile Parkway (Exit 81). The parkway extends north connecting I-24 to Hopkinsville, Nortonville, Madisonville, and Henderson. Photo taken 11/07/11. Originally named the Pennyrile Parkway, the state redesignated the 78-mile parkway as the Edward T. Breathitt Pennyrile Parkway in 2000. The former Kentucky governor (1963-67) spearheaded highway funding improvements during his administration, including for the Pennyrile Parkway. Photo taken 11/07/11. A loop ramp leaves for Exit 81 and the Pennyrile Parkway north to Hopkinsville. A 7-mile extension tied the parkway from U.S. 41 Alternate (Exit 7) with I-24 by 2011. The parkway otherwise carries I-69 between the Western Kentucky Parkway (Exit 34) and U.S. 41 (Exit 78) in Henderson. Photo taken 11/07/11. Edward T. Breathitt Pennyrile Parkway, Kentucky Roads (www.kentuckyroads.com). “Pennyrile Parkway officially opens”, The Eagle Post (newspaper), June 29, 2011. “State to extend Pennyrile”, The Gleaner (newspaper), May 6, 2006. “Pennyrile Parkway extension opens”, www.14news.com (TV and news), March 1, 2011. “Public Law 110-244-June 6, 2008, SAFETEA-LU TECHNICAL CORRECTIONS ACT OF 2008”, U.S. Government Publishing Office (www.gpo.gov), June 6, 2008. “Senate Unanimously Passes Sen. Rand Paul’s Amendment to Designate Interstate I-169 in Western Kentucky to the Transportation and Housing Appropriations Bill”, official Rand Paul (U.S. Senator) website (www.paul.senate.gov), May 19, 2016. Kentucky Transportation Cabinet (KYTC) District 2 Facebook “Future I-169 spur” albums page. Page updated April 24, 2018.